Canada's Felix Auger-Aliassime fell to Ivo Karlovic of Croatia 6-4, 7-5 in the first round of the Tata Open Maharashtra on Tuesday. 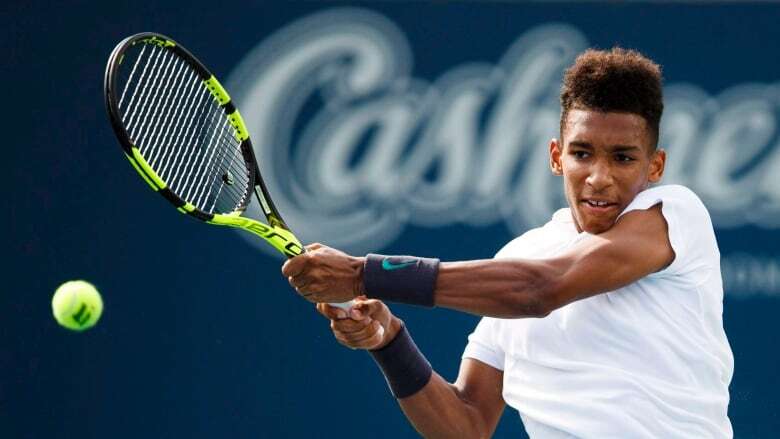 The 18-year-old Auger-Aliassime, ranked 109th in the world, advanced to the main draw of the ATP 250 tournament after defeating Italian Gianluigi Quinzi 7-5, 6-3 in his final qualifier. The Montreal native was born the same year the 39-year-old Karlovic turned pro. Karlovic will face Evgeny Donskoy in the next round. Canada's Bianca Andreescu has advanced to the second round of the WTA's season-opening ASB Classic. Andreescu, 18, downed Timea Babos of Hungary 6-4, 7-6 (8) in a first-round match Tuesday. The qualifier from Mississauga, Ont., dispatched Babos in one hour and 46.45 minutes, firing seven aces along the way. She will take on the winner of former world No 1. Caroline Wozniacki of Denmark and Laura Siegemund of Germany, who she defeated 3-6, 6-3, 6-3 in the final round of qualifying. Andreescu joins fellow Canadian and former world No. 5 Eugenie Bouchard in the second round. Bouchard kicked off her season with a commanding 6-3, 6-3 win over American Madison Brengle on Monday. She is slated to face qualifier Bibiane Schoofs in the second round.